I recently had one of those, “why didn’t I think of that” moments. While perusing through Instagram the other day I stumbled across a post by Oxygen Magazine that showcased one of their clean eats recipes. To be brutally honest, you can barely call it a recipe considering it was two ingredients…bananas and oats (plus optional dark chocolate chips). After noting that you simply mix them up together and bake em in the oven at 350 for a short 15 minutes I thought….”DUH…baked oatmeal.” While many of you probably have made similar items before I’m really hoping I wasn’t the last to know and some of you will be just as delighted as I was to discover this amazingly easy yum yum. At first I decided to give them a try with some added cinnamon. They turned out great. I wasn’t ready to stop there though so I concocted my own rendition complete with the bananas, oats, cinnamon, reduced-sugar dried cranberries, chopped almonds, cacao powder, and some vanilla protein powder to give them a little more purpose (pre-workout snack). I pretty much stole the ideas for these ingredients from some snack bars Cindy made me a few weeks ago. Let’s just say that they are flippin amazing, so easy to make, and crazy convenient for taking on the go. I used my little magic bullet wannabe blender to mix up the dry ingredients and bananas (seemed easier than mashing with a fork). Toss in the oats, cranberries and almonds and you’ve got yourself some batter. Use a spoon to throw some dollops on a baking sheet, toss them in the oven at 350 degrees for 15 minutes and BAM…you’ve got yourself a stupid good snack, breakfast, pre-workout meal, traveling clean eat, or even dessert (uhhh hello vanilla ice cream on top). 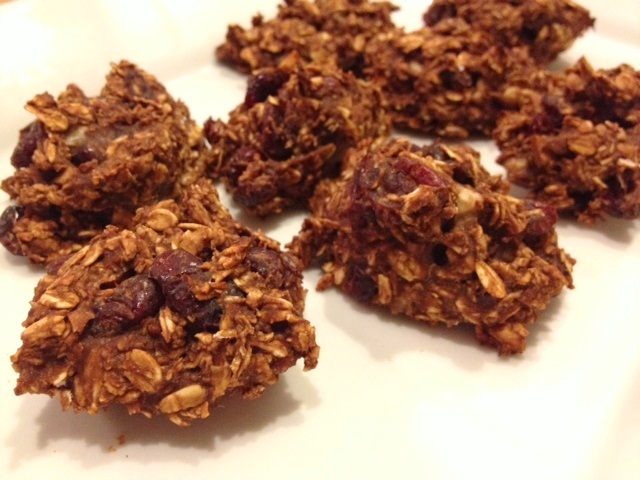 If you’re like me, your mind is probably wondering to even more alternatives to how you can create your own oat clusters. Think about any kind of oatmeal you might like and start there. The good news is if they don’t turn out all that great the first few times you’re only out some spare change in the cost of ingredients. Even better…these are a fun and easy thing to throw together with the kiddos helping out. Mash up the banana (or blend) and stir all ingredients together. Place heaping spoonfuls on a non-stick or greased baking sheet evenly so they are spread apart and not touching. Bake at 350 degrees for 15 minutes. Ding! That simple! I hope you enjoy! 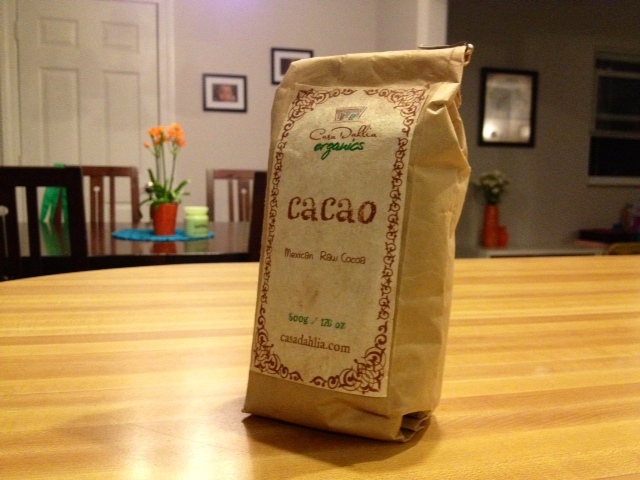 The cacao powder (if you’re wondering if I misspelled “cocoa” click here) is fresh from Mexico, recently purchased during our Recalibration Vacation from a place called Casa Dahlia located in the heart of San Jose’s art district. Maybe it was the wine, maybe it was the ambiance of the cutest courtyard cafe I’ve ever set foot in, or maybe it was the super duper hot Mexican guy named Mario in his apron selling it that made me compelled to purchase some. Most likely it was all of the above but either way I made sure I didn’t leave that place without a bag of organic Mexican coffee beans and a bag of ground cacao. Let me tell ya, both have not failed to represent at all. Very yum yum! To check out the original inspiration from Oxygen Magazine’s post you can check out their Instagram photo at http://instagram.com/p/ZOLnn-KZ6e/. My first time reading a blog! Remember my first cell phone was 2 years ago and I never turned it on . . . I can’t believe how professional it looks, how engaging your writing style is, and I can’t wait to try the oatmeal snacks. Sounds like the beginnings of sharing your strong, beautiful, amazing self with others. Congratulations.